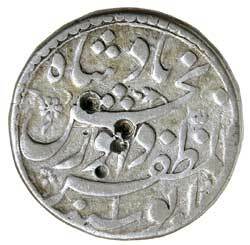 DAWAR BAKHSH, (A.H. 1037, A.D.1627), round silver rupee, (11.15 g), struck at Lahore Mint, issued A.H. 1037 (A.D. 1637), regnal year 1, obv. ruler's name, rev. 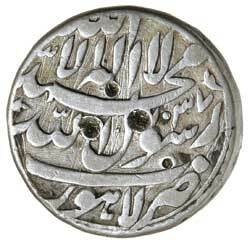 mint name lowest line on reverse, (KM.195.1). Very fine, with several tests marks both sides, extremely rare. Ex Dr V.J.A. Flynn Collection, bought in Kabul in May 1972 for the equivalent of �1, together with his original descriptive envelope. When Jahangir died on 28 Safar, A.H. 1037 in Kashmir, his powerful courtier Asaf Khan feared the Queen Nur Jahan would place on throne her favourite son Shahryar as the new king. He enthroned Bulaki, the son of Jahangir's second son Khusrau, as 'Dawar Bakhsh'. The Khutba was read in Dawar Bakhsh's name at Bhimbar. His position was bolstered by his brothers and cousins joining him. Asaf Khan first defeated Shahryar's army on the outskirts of Lahore and then having secured Shah Jahan's agreement, proclaimed him as the emperor on 2 Jumada-I 1037. The puppet Dawar Bakhsh was killed along with his brothers and cousins who had sided with him by Shah Jahan's orders on 26 Jumada-I 1037, thus bringing his short reign to an end. A pleasing example, with the entire text fully visible with test marks, even the BM and the KM illustrated specimens have test marks. Hull notes only 4 known examples of this ruler but today less than 10 survive.